New and Improved but Not Soon Enough:. The M1918 Artillery Cart—. By 1918, the developments in telephone and telegraphic communication played a major role in how armies fought on the battlefield. For artillerists, this meant the eventual end of signal flags and runners. Now forward observers could report back to the gunners over telegraph and field phones. But, unlike the wireless communications of today, this new way of sighting artillery required thousands of feet of wire and supporting equipment to make it work. 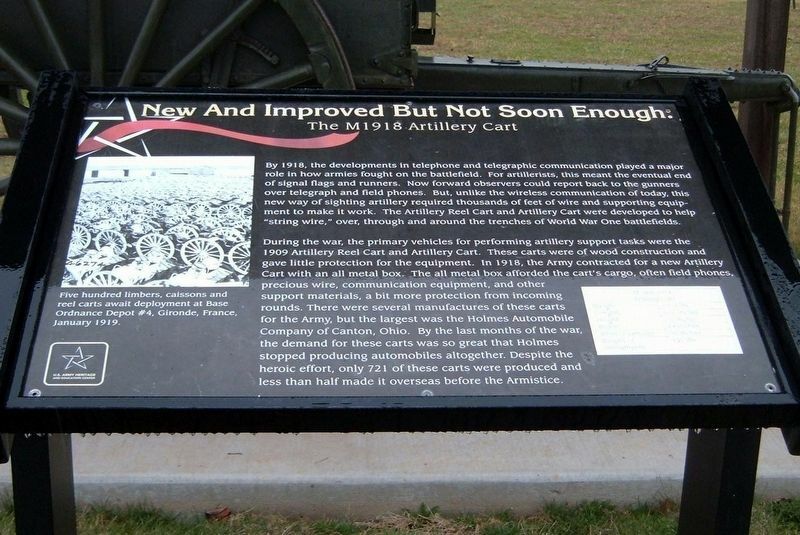 The Artillery Reel Cart and Artillery Cart were developed to help “string wire”, over, through and around the trenches of World War One battlefields. By 1918, the developments in telephone and telegraphic communication played a major role in how armies fought on the battlefield. For artillerists, this meant the eventual end of signal flags and runners. Now forward observers could report back to the gunners over telegraph and field phones. But, unlike the wireless communications of today, this new way of sighting artillery required thousands of feet of wire and supporting equipment to make it work. 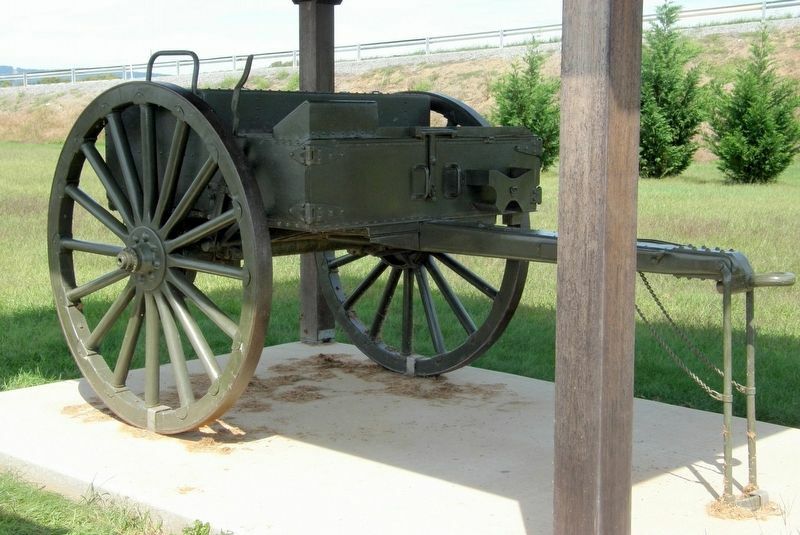 The Artillery Reel Cart and Artillery Cart were developed to help “string wire”, over, through and around the trenches of World War One battlefields. largest was the Holmes Automobile Company of Canton, Ohio. By the last months of the war, the demand for these carts was so great the Holmes stopped producing automobiles altogether. 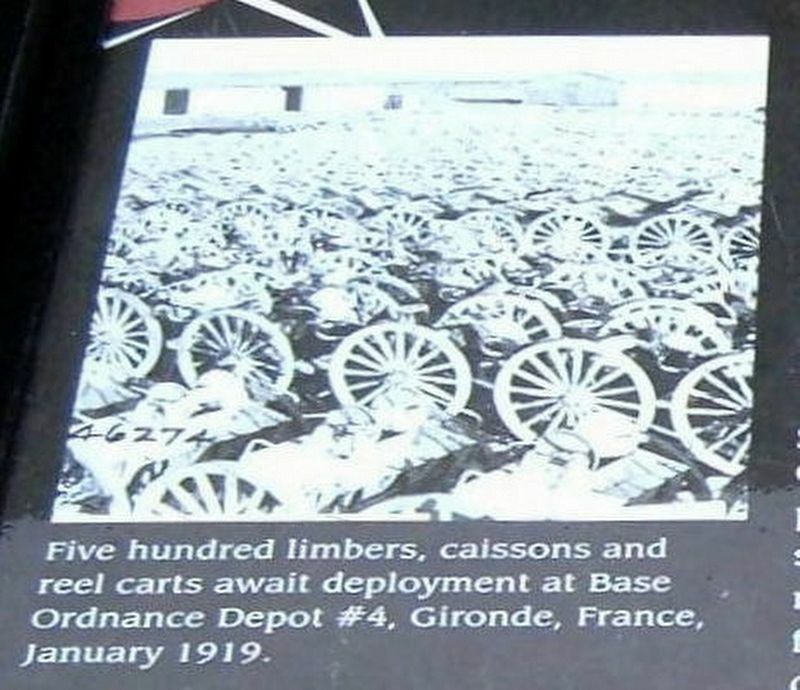 Despite this heroic effort, only 721 of these carts were produced and less than half made it overseas before the Armistice. Location. 40° 12.367′ N, 77° 9.44′ W. Marker is in Carlisle, Pennsylvania, in Cumberland County. Marker can be reached from Army Heritage Drive, on the left when traveling south. Touch for map. Marker is in this post office area: Carlisle PA 17013, United States of America. Touch for directions. Other nearby markers. At least 8 other markers are within walking distance of this marker. A Tough Nut To Crack (here, next to this marker); Loyalty (a few steps from this marker); The Front (within shouting distance of this marker); No Man's Land (within shouting distance of this marker); The Mortar Pit (within shouting distance of this marker); Sniper's Nest (within shouting distance of this marker); Selfless Service (within shouting distance of this marker); Splinter Proof (within shouting distance of this marker). Touch for a list and map of all markers in Carlisle. More. Search the internet for New and Improved but Not Soon Enough:. Credits. This page was last revised on June 15, 2017. This page originally submitted on June 13, 2017, by Larry Gertner of New York, New York. This page has been viewed 79 times since then and 4 times this year. Photos: 1, 2, 3. submitted on June 13, 2017, by Larry Gertner of New York, New York. • Bill Pfingsten was the editor who published this page.